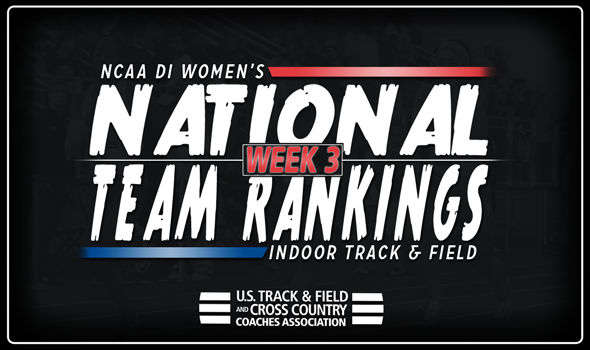 NEW ORLEANS – The comfort of home propelled Kentucky’s women’s indoor track & field program to a big week, giving it just enough of a boost to move into the top-five of the NCAA Division I Women’s National Team Rankings. After dominating at its home meet, the Rod McCravy Memorial at Nutter Field House, the Wildcats moved up four spots into fifth place on the week in what was the lone change in the top-five on the women’s side of the rankings, announced the U.S. Track & Field and Cross Country Coaches Association (USTFCCCA) on Monday. Kentucky got a huge performances out of a seasoned vet and a rookie in Olivia Gruver and Sydney McLaughlin. Gruver posted the top pole vault mark in all of Division I on the season, clearing 4.65m (15-3), while McLaughlin’s time of 51.44 in the 400 meters also tops the Descending Order List. The Wildcats also saw four other top-15 Descending Order List marks set on the weekend, putting them right behind Arkansas, Georgia, Oregon and Southern California at the top of the rankings. The Razorbacks held onto first with a solid outing itself in the jumps events. Lexi Jacobus, Victoria Hoggard and Desiree Freier notched the second, third and sixth-best pole vault marks, respectively, on the season in NCAA Division I at the Texas Tech Open, while Taliyah Brooks’ long jump mark at the same meet is good for sixth on the Descending Order List. Georgia, Oregon and Southern California were all idle on the week. LSU held its ground in seventh, but Florida (sixth), Texas A&M (eighth) and Texas (ninth) all slipped in the top-10. Minnesota made its first appearance in the top-10 since the second week of the 2009 season by moving up one spot to 10th. The Golden Gophers were led by its distance medley relay squad at the Michigan Power 5 Invitational, as the quartet notched the fifth-best time on the season in the event at 11:07.53. Outside of the top-10, Missouri and Indiana made the biggest jumps in the rankings. The Tigers moved up 18 spots to 14th for its first top-15 appearance since week two of 2015. The leap in the rankings can be directly attributed to the record-setting performance from Karissa Schweizer, as she broke Jenny Barringer’s 3000 meter collegiate record with a time of 8:41.60 at the prestigious NYRR Millrose Games. The Hoosiers returned to 23rd after slipping to 37th a week ago. Indiana’s distance medley relay team posted a time of 11:06.18 at the Michigan Power 5 Invitational, good for fourth on the Descending Order List this year.